Yoho National Park was established in 1885 and represents the western slopes of the Continental Divide in the Rocky Mountains. The park belongs to the four Rocky Mountain Parks jointly declared a World Heritage Site by UNESCO in 1984. In the Cree language Yoho means awe and wonder for this amazing place of waterfalls, glacial lakes, snow-topped mountain peaks, roaring rivers, deep silent forests, and spiral tunnels inside the mountains. Yoho holds the secrets of ancient ocean life, deposits of fossils, more than 120 species of marine animals from the Middle Cambrian epoch - about 515 million years ago. Through erosion and the power of ice and water, nature has carved some of the most dramatic landscapes into the country. 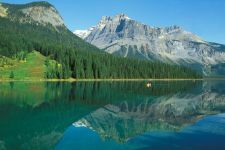 Yoho National Park is open year round, offers several campgrounds, lots of trails, guided tours, canoeing, kayaking, fishing, mountaineering and climbing. Contact the Yoho Visitor Centre in Field for more information and reservations. If you are planning a trip to Yoho National Park during the months of July and August be sure to book your accommodation in advance. In the centre of the park you can visit the town of Field providing basic services such as restaurants, a post office, a general/liquor store, voluntary ambulance and fire fighting services, a pottery studio, a Greyhound bus stop, a lodge and guest houses. A park pass is required for all visitors to national parks. This pass is available at the park gates or contact the visitor information centre of Parks Canada. Please visit Parks Canada for more information.